How much pain can you endure and for how long can you endure that pain? Each time the line is toed that question stands out. 50 miles will strip you down and show you part of yourself in very simple terms. Sometimes it shows you your strength and perseverance, what the best in you does against adversity. Sometimes it shows you your darker tendencies. Sometimes it shows you both at different points. 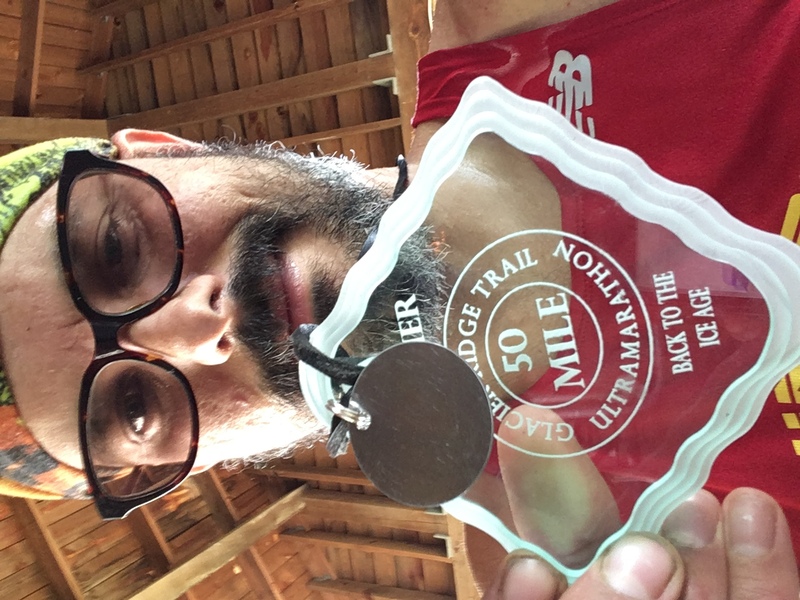 The Glacier Ridge 50 showed me what I was capable of and also what I needed to be mindful of in the future when going the distance. The alarm went off at 3:00 AM. I had slept fairly well for 5 hours. The car was already packed, my clothes laid out, and the espresso machine simply needed to be turned on which I did first thing. I finished half a bottle of REBBL maca mocha, had some water, and got dressed. First stop? Sheetz for gas and a omelet wrap. These little tasties have become a staple for me when I’m driving somewhere further away to run. I ate in the car and race day nerves laid heavily upon my gas foot. Dave is that you? It was. I had worked with Dave in my professional life. The company I had worked for had a long relationship performing testing for his company. We had become friends over e-mail when we both found we ran ultras. 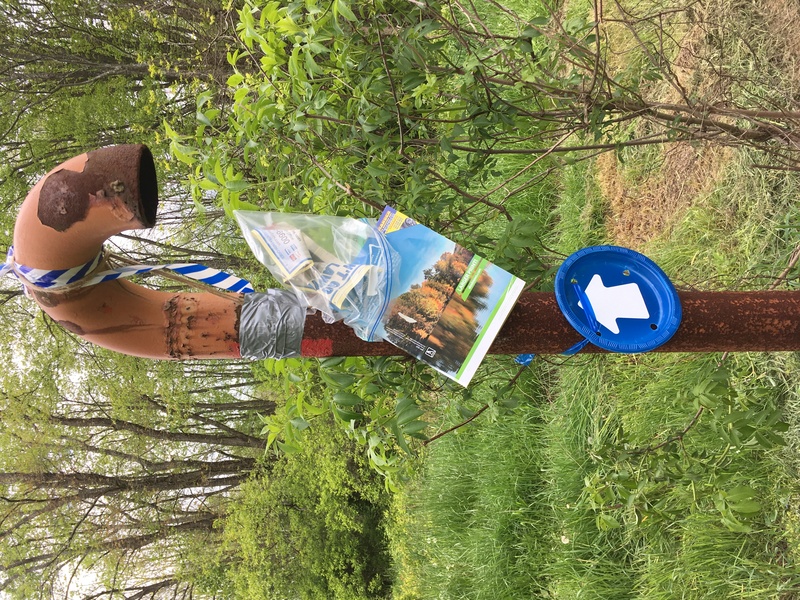 Back in November I was setting up a fatass run from McConnell’s Mills to Jenning’s Environmental Center in Moraine State Park and ,without ever having met, Dave offered to setup an Aid Station for us. It was a huge service on a frigid snowy day and I, along with the other runners, were deeply thankful. Dave would be helping out with logistics and taking care of us all throughout the day again. Tammy was checking everyone in and I soon had my race bag and was back at my car pinning the bib on. Runners were arriving. I left my drop bag in the designated area and after a short race info session we were promptly off! Fifty runners were signed up for the 50 miler. I’m not sure how many actually started, but I can tell you 42 finished. The weather was cool. I started with arm sleeves and gloves and by mile two had them shoved in my pockets. I opted to run most of this race with a handheld and two RooSport pouches for carrying a phone, mileage chart, and Hammer supplements. With aid stations fairly close I would only need my full pack from miles 20-40 where they were spaced further, though in hindsight I could have just brought a second handheld. The next stretch lead to Route 528, which is the main Aid Station for the event. For the 50 milers we would be here at miles 10, 20, and 40. Here was the largest spread of food, the most volunteers, and our precious drop bags. En route to this aid station a runner came up hot on my heels, then I’d pull for ahead on downhills. She would catch up again on the uphills. We began talking and soon Gineen and I forged a friendship swapping stories and the miles flew by. The single track leading to Rt. 528 is exceptional. 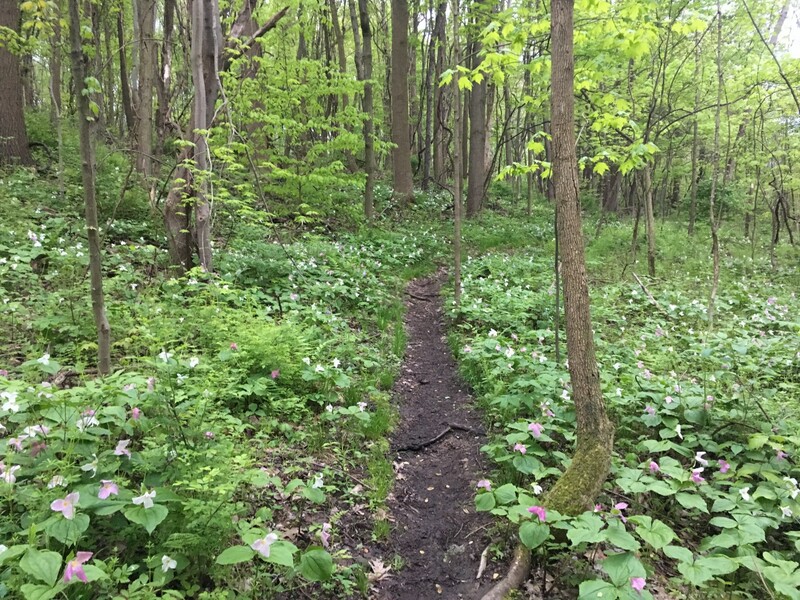 Trilliums were in bloom all along the trail and numerous purple flowers of undetermined type. Arriving at the aid station I grabbed some food and filled my handheld. Gineen and I stuck together for a little longer still. mileage section. My arsenal included Hammer Endurolytes, Race Caps, and Endurance Aminos. I’d have to get my electrolytes at the aid station instead and what an aid station it was! Upon arriving there I was ecstatic to find ramen noodles! They had boiled potatoes, avocado slices, and all the normal fare (m&ms, pretzels, soda) That was some serious trail eats! The leaders of the 50k race had caught up to us here. They started a full hour after us and caught us by mile 15! Letting the fasties enter the trail first Gineen and I were off again taking the loop around Jennings. It was a beautiful section full of diverse flora. The trail was easy here which was welcome. Reconnecting with the North Country Trail we were now returning to Rt 528. The talk had died down and I was starting to feel the miles, or perhaps it was just the food settling. Rounding a turn I heard a familiar voice and descending a small hill saw her. Suzanne was who I had heard and Cristin was with her along with a small group of ladies. I yelled “sweaty trail group hug” and grabbed them both and quickly continued down the trail. We traced our steps back to the 528 Aid Station, now at Mile 21. This time I would be certain not to forget my drop bag. Coming in a volunteer asked to fill my bottle. I handed it to him and then quickly asked for it back realizing I was switching to my Ultimate Direction PB vest. Seth was here and was a welcome sight. We talked for a bit. 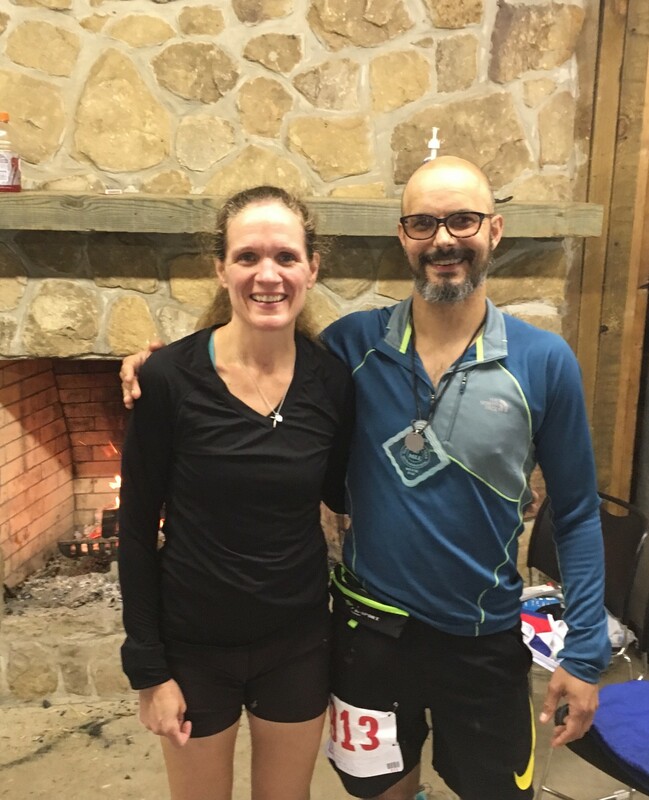 His wife and my friend, Beck, was running the 30k and it was her first long trail race. I switched from my hat to a half buff, wiped the salt from my eyes, and grabbed my Hammer supplements. I had brought Altra Lone Peaks for this upcoming section, but opted to stay in my trusty Luna Leadville Gordo sandals, a decision I would not regret. The volunteers took my bottles and filled them up. I had preloaded one bottle with Heed powder. Meanwhile, I snacked on everything in sight. A hard lesson learned on this day is in direct relation to this previous sentence. Do not eat 4 cuts of grilled cheese plus numerous other foods including cookies, gummies, and fruit while you are running. I felt so hungry and went overboard stuffing myself. The rest of the day was to be filled with GI pain, but fortunately nothing worse (or messier) than that! Immediately after leaving the aid station I realized my error. Back on the trail I found I couldn’t drink. I was so full of grilled cheese and snacks that I simply couldn’t take water in for almost an hour leading to early signs of dehydration. It was something I came back from, but I am certain my time would’ve been better had I not made that error. Gineen had left Rt 528 before me so it was back to some solo time. Entering the Swamp Run leg of the race there were some very runnable sections punctuated by short, but deep, muddy sections. All in all , this 20 miles is my least favorite of the course, but it wasn’t all that bad either. A short section of single track led to about 1.5 miles of gravel road. Passing a gate I entered the fire roads that would edge around the swampy end of the lake and take me to the next aid station at mile 29.2. All told there were about three flat easy miles out of the 8. I dropped into comfortable 10 minute paces and happily moved along…happily except for that intestinal pain. On the hill climbs I passed a few people. I could here a voice getting closer. Topping the last hill before descent towards the aid station I could see a girl coming up quickly. I continued down into the grassy field and soon she had caught me. She was a relay runner which made me feel a little better when she flew by. Coming into the Swamp Run aid station at Mile 29.2 the volunteers sprung into action asking if I needed anything. I said I was ok and would stop in 2.5 miles to fill up after the turnaround section. As I was leaving I said hi to Gineen, who was eating a popsicle. I took a mental note to get one of those on the return. A mental note that would not go remembered until this moment in which I am writing this. I was looking around for Elisa, who had offered to pace me, and saw her as I was leaving the parking area. We said hello briefly. I told her I’d be back in 2.5 miles so that should only take 6 or 7 hours. We both laughed and I headed out to the turnaround section. This stretch was the worst in some ways. There was a ton of slippery mud and some short, but steep climbs. I was looking forward to seeing some friends and sure enough I saw Patrick first. Next was Tim coming up a big hill. Fortunately I was going down it (for now). Coming up a climb and across a field there was the candy cane pole with a telephone book hanging from it. We were required to tear a page from the book and bring it back to the Swamp Run Aid Station as confirmation of reaching the end. Another runner was there. I asked him to pull a page with pizza joints so we could order. The return seemed quicker than going outbound and I quickly found myself back at the Aid Station. Elisa was ready to go. I took a few minutes to fill my bottles with water and Heed and, of course, to snack. After eating a salted potato, some watermelon, and a few other odds and ends we headed off. Elisa was quick to ask what I needed from a pacer. Should she stay in front? Or behind? Should she talk a lot or be quiet and run? I said I really didn’t know, but to stay behind or along side me and maybe lead on the hills. We immediately began chatting about running. She is a fast runner and one that has won races. I worried my snail’s pace would be hard for her to keep, but she was fantastic. I began walking more as we made our way towards Mile 40. Once past the hills the flat sections leading back to the aid station passed quickly with a steady, albeit slow pace. As we neared Mile 40 a large group of people were up on the hill cheering. Crossing into the Aid Station there were more cheers. I swapped out my pack for the handheld and grabbed my last bag of supplements. Dave was there and we talked a bit as I ate some grilled cheese (just one piece this time!) and other treats. The climb out of the aid station was tough. It was a short steep hill and my body was done. I had to stop halfway up. The next 5 miles would be the worst of the race. I felt drained. Walking intervals were becoming longer and even slight hills were a struggle. I focused on keeping up on fluid intake. After a seemingly endless grind we came to the Mt. Union fluid station. Dave was here too. There might be 5 of him. I had two little paper cups of Heed, refilled my handheld, and ate two tangerines. The tangerines really hit the spot! The last 5 miles went fairly well. I was running more and even starting to run some of the up hills again. With each hill Elisa and I joked that this was the last hill….until the next one. The hill which was truly last was steep and a bit of a struggle. Once it was finished the remainder of the single track was comfortable and easy. realizing I didn’t know what that meant. The birdhouses were in a field next to the parking lot for the race. We had arrived! Making the final turn the finish line was very close. No drawn out approach. I crossed the line to the cheers of runners and volunteers and happily found a picnic table to lay down on. Done! Official time of 11:41:58 and a finish of 25th out of 42. Good enough for a PR by ten or more minutes as compared to the front 50 miles of the Burning River 100 last year. 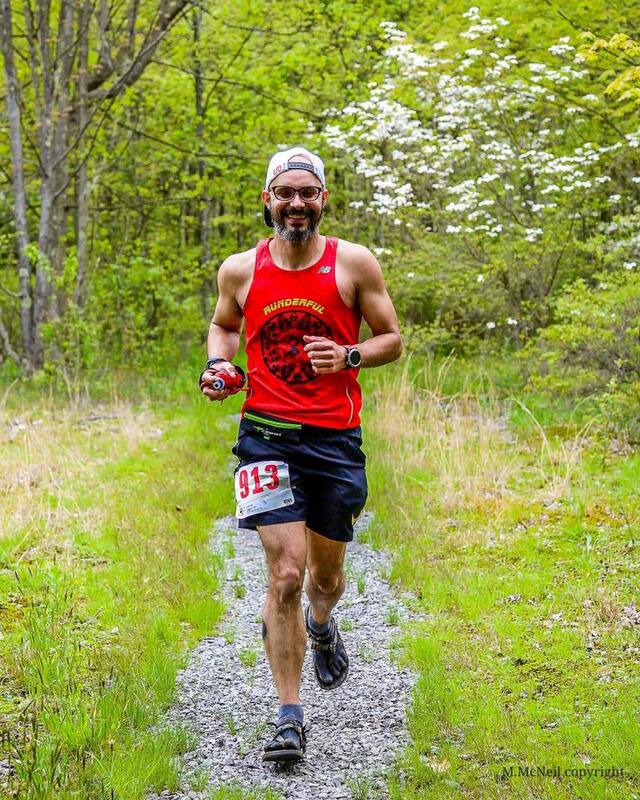 A PR by over an hour and fifteen minutes by the only other official 50 mile race time I had, The Burning River 50 from 2015. I highly recommend this excellent race. There are 30k and 50k distances as well so there is something for everyone. All proceeds benefit Moraine State Park and maintaining it’s trail system. The volunteers were phenomenal. Put this on your 2018 race calendar!